Sixteen percent – according to a 2015 Pew poll, that’s the number of United States citizens age 18-24 who read a daily newspaper. 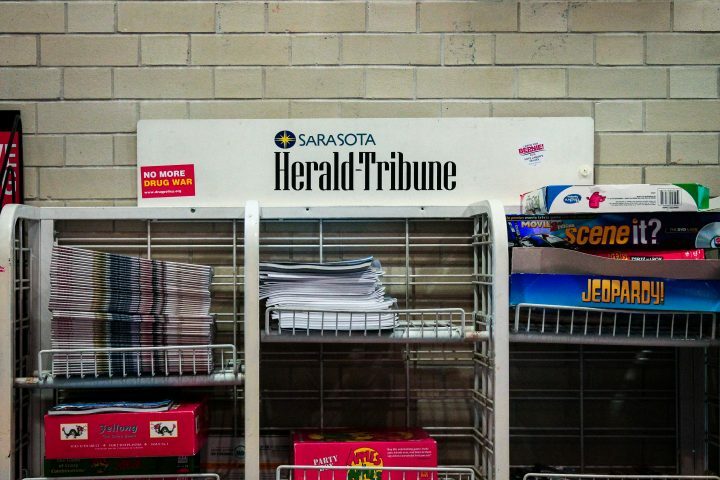 $3,000 – that’s the amount spent by the New College Student Alliance (NCSA) each year to furnish Hamilton “Ham” Center with free paper copies of the New York Times (NYT) and the Sarasota Herald-Tribune (SHT) every weekday. At the beginning of this year, where one used to be able to find stacks of these venerable publications, now reside approximately five copies of the board game Apples to Apples and a free weekly paper, the Sarasota Observer. Adjunct Assistant Professor of Quantitative Methods Duff Cooper could often be seen scanning an open copy of the NYT during lunch hours at Ham. A budget line has existed to pay for the newspaper subscription since at least 2009, and in a 2015 announcement on the Forum, former NCSA Co-president Paige Pellaton stated that online access to the NYT would also be available to students. The passes enabled up to 20 students to view the newspaper online at one time. The removal of the weekday newspaper was a decision made by the 2016-2017 NCSA cabinet. According to NCSA Chief of Staff (CoS) Katie Thurston, the NCSA budget was changed last year because cabinet members felt that the newspaper subscriptions were prohibitively expensive and did not have sufficient readership to justify the cost. Former NCSA Co-president Paul Loriston was a member of the cabinet that decided to cancel the subscriptions. Loriston said that the decision was motivated by pressure from the administration regarding the Activity and Service (A&S) fees used to fund the NCSA. “Maintenance just ended up having to throw them away because they ended up spread out on the tables or the floor,” Thurston said. Despite the financial reality of the NCSA’s budget and the apparently low readership of newspapers among college-aged people, some still lamented the loss of easy access to the paper during breakfast, lunch or dinner. Associate Professor of History Brendan Goff qualified that his appreciation for print news was not based simply in nostalgia.